Mel and I collect Carlo of Hollywood watercolor paintings with the angular and/or forced perspective frames. If you are selling any we’d love to see them and possibly add them to our collection. Below are some examples. Here is a vintage ad with the pieces we are looking for, but we’re looking for pink and gray. We are looking for the 2 pieces marked with a *. Below is our set we are trying to complete. We’re looking for at least 4 more Tickled Pink mugs. I have a ballerina lamp that is sooooooo very similar to your fish lamp. All of the color (I remember very very faint pastel-y colors on her bodice, tutu and tights especially though it may have been all over) is gone and she is just a pale off white now. How can I find the original colors like you did for your fish lamp? Is there a place where I can post a photo of her for you to see? I LOVE her sooooo much! You can shoot a photo to me at my e-mail address and I can see what I can find for original colors for it. You can email me at hepcatrestorations@yahoo.com. Look forward to seeing pictures! Ohhhh, I just saw your reply – 2 years later! I hope the offer still stands. I’ll take photos of my ballerina lamp and 2 other lamps that you might like to see. A man dressed in 18th Century fashions standing by a chair in front of a harp. And a woman in a full 18th Century skirt standing in front of a harp, too. They are stamped Universal Statuary Corp. Chicago (one of them says Chicago 22. ILL,) Copyright 1958 N. S 052. Those are nice lamps. Unfortunately there is not much to tell you that the lamps haven’t already revealed. The lamps give you the makers mark and year so that is a lot in its self. The Universal Statuary Corp. Chicago wasn’t as well known as Reglor or Continental Art Company but they were known. 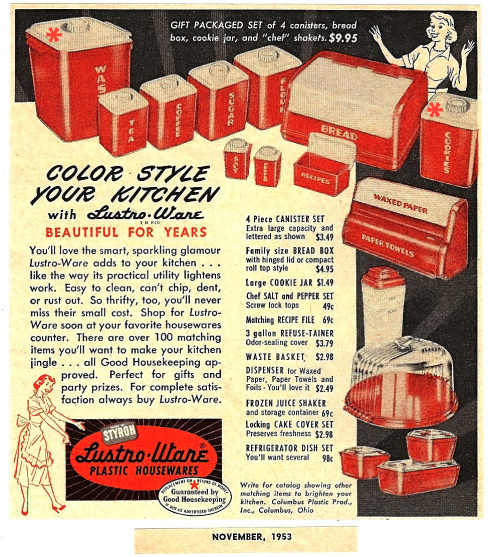 I searched the internet and all I could find is the following info:“The Universal Statuary Corporation of Chicago is a company started by the Lucchesi family and which produced traditional Italian type designs of products from plaster or chalk ware”. I wish I could tell you more but the usual problem with many items from that period is that these companies just disappeared and nothing is known about them. It is a shame when a company makes so many great things and did nothing to preserve its history. I wish I could have been more help to you. As an avid collector of all that is 1950’s I love your site. 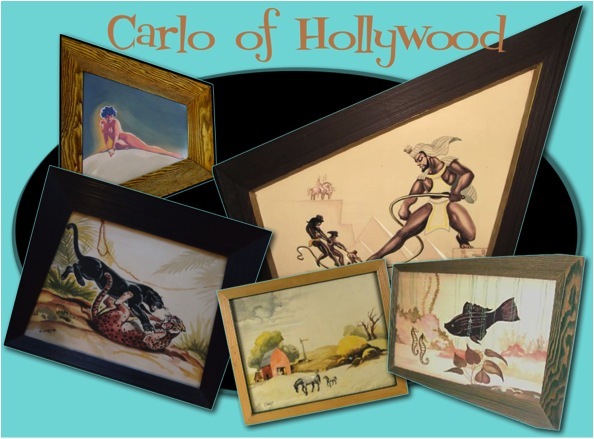 Are you looking for Carlo Paintings as well? Hi Jack. Yes, Carlo water colors with the angular/forced perspective frames. No! I wish I could. I am also looking for the griddle. Hopefully both of us have luck in the future. I know this was from 2011 however I was in Des Moines recently and they had an NOS 3 n 1 rotisserie. “Just in case” the store is called Funky Finds. Was it for the Westinghouse roaster? Hey Frank! What do you think of the site? Thanks for the heads up! We are watching this one already. This one is blowing up compared to the one that just sold. I am glad you found our site and I hope you post often. Thanks! Thanks soo much for passing this along! might be interested in. How can I send you a picture of the one I have? Thanks for reaching out to me. 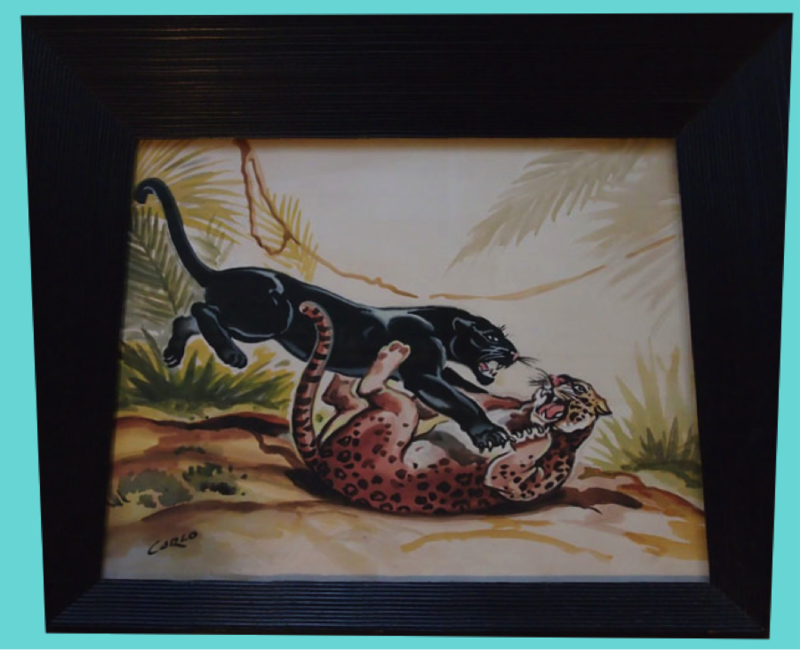 When you are ready to sell your piece please email me at hepcatrestorations@yahoo.com. I have 1 vintage Westinghouse griddle roasters and also a one that I believe to be a warmer. The warmer has 3 glass food containers, and 2 of the containers have glass lids. Both have the base cabinets with the timers on them. I could email you some photos of them if you would like. They haven’t been restored but both are in fairly good condition. Love your products, and how your keeping our past alive one item at a time. Please send picture when you get a chance I would like to see it. Thanks for your comments and your support I really appreciate it. Thanks! Are you still looking for the bamboo end tables and coffee table ? I am looking for coffee table, end tables and corner table still. I am looking for ones like I listed. Thanks! Thanks for the info. I will let Mel know. I’m trying to register for your feed to the blogposts and must have subscribed to some sort of comments feed. I would like to unsubscribe from the comments and simply get your posts, if that’s doable. Thanks a lot. What email address do you want the posts to be sent to? Congrats on finding the rattan pieces. I was watching “My Dear Secretary” (Kirk Douglas, Laraine Day, Keenan Wynn 1948) which has terrific interiors like an all white living room a bedroom with a lamp that was amazing but the film was too grainy for a good look. I swear his beach house furniture had 9 bands of rattan. I have the movie in a boxed set of DVDs with average (for the price) quality transfers but if you want a peek you can rent or buy a download on Amazon. Thanks for dropping by my site. I’m in Sacramento, California. Looks like that movie can be rented through Netflix. Thanks for the heads up. I just added it to my queue. You might want to check out E Street Thrift in Sac. – there are some ceramic figurines that look like others you’ve highlighted here and two chalkware heads. Not sure if it is what you are looking for, but I thought of you when I saw those pieces. Thanks so much for the heads up! It’s nice to hear from someone local :). Nice Carlo colection. BTW…just curious….was Carlos gay? I mean, so many of his paintings consisted of either shirtless men, ballerinas, men in tights…etc. Thanks for the compliment. To be honest with you there is really no info on Carlo especially his sexual orientation. His subject matter may hint at his orientation but I just don’t know. All I know is I love his work! have you ever seen what Carlo of Hollywood looks like? No, We really don’t even know much about him either. Most of it seems to be speculation. I wish there was more info on him. i have a picture it is rectangular about 5 foot long and not very tall. it is carlo of hollywood stamped. the scenery are cactus, and the colorful dessert behind it. where can i find out how much it is worth? i have a carlo of hollywood picture could you refer me to an appraiser? Hi! I have been trying to find out about a painting by Gill that I have of a Paris street scene, it hung in my father in law’s study for many years. 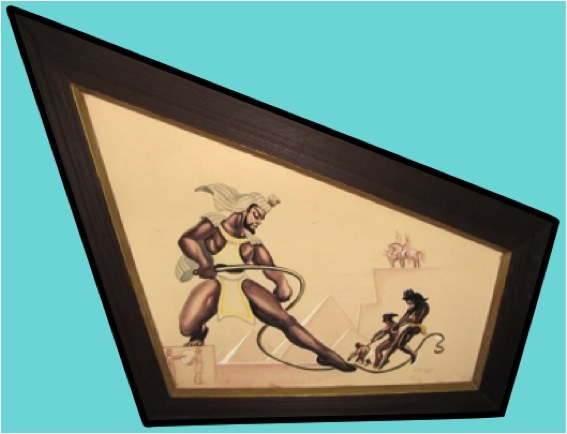 It is Appx 16″ High by 36″ wide not including the original frame. I would like to sell it but cannot find any prices for the ones like this. I have some pictures of it, any suggestions? Thank you! I have two original Gill water brush paintings. Does anyone know what they might be worth? I have a large 51×24 Carlo of hollywood painting of Moulin Rouge city scape. Beautiful city scape. It’s an original with Devore as the atist done at artcraft of lincoln heights. It says its an original on the back. Do you know what I could get for it? I previously forward to you copies of 3 pictures I have. They where purchased in 1956 in Long Beach, Ca. 1 large oriental and 2 smaller orientals. I am trying to get an appraisal on these water colors. If you did not receive my email and would like to see these pictures please reply. Love your site and thank you for reminding me how cool things were from this time and why I love them so much. Your collections are amazing and I actually stumbled upon your site after I was trying to find information on the two paintings I came across at a local thrift store the other day. The frames really caught my eye and the pictures are pretty cool as well. They are original Carlo watercolors very similar to the ones that you indicate you are looking for (very top of the page with palm trees in a green frame). I am not sure if I am going to keep them or what I am going to do with them, but I would like to know if you have any suggestions on restoring them or who does this type of thing? If I do decide to sell them (I have so many other projects that I am working on, so this one may be too much for me), would you be interested? Thanks again for the amazing site…love your taste! Sorry for my late response. If you send me pics at hepcatrestorations@yahoo.com I can take a look at them and give you suggestions on restorations. If you decide to sell them I might be interested. OMG! Just yesterday, for my birthday, I received the piece that appears in the lower left-hand corner of the top set of four paintings. It is just gorgeous. Now I must find the one that appears in the top right-hand corner of the same set. I am officially hooked. I have a pair of Carlo watercolors almost identical to the pair you have listed(the frame is very dark),they are of 1.) a slave woman chained? and 2.) a slave man chained. Feel free to mail me with your interest and/or comment. Thank you for your time and consideration into this matter. Sorry for my late response. If you still have them let me know what you are asking and if you can send me pics. Thanks! I’m selling it…thought you might be interested…. I appreciate the offer but I do not collect the oils. 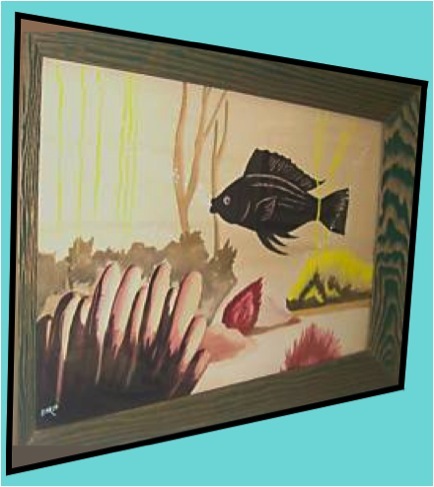 I have a “Gill” acquired in the 50’s…..it is not one of the Hawaiiana that you see online…can you venture a value? I would have to see it. Feel free to send me a picture of the art at hepcatrestorations@yahoo.com. I “inherited” a pair of chalkware lamps that have some damage. (Not uncommon for the age of these pieces from what I’ve read).They’re kinda cool, but I don’t know what to do with them. I’m trying to figure out who made them. I thought they were Reglor, but they don’t have the stamp. If I send you an e-mail, can you tell me what you think? I’m guessing you know alot more than I do about these. Thanks! Hello Dee, send pics to hepcatrestorations@yahoo.com. I have a Heywood Wakefield Rio bedroom set in great condition. I’d be happy to send pictures if you are interested. I wish I had room for a second set but I dont. I am sure someone will jump on your set. I have two continental art lamps that look like peter pan and wendy — gold and black — and pretty tall. Are you at all interested? I would be interested in seeing them. Send pics to hepcatrestorations@yahoo.com. Thank you for what you did provide. That was more than what I got on the Universal lamps. Any ideas on the ballerina lamp? Just wondering. Thanks!! Hey Kelly, can you send me the ballerina pics again. I cant find them now! I had saved them I thought. Thanks Jirral. We ended up buying it! Hey Hepcat, I am looking for the lampshade for the Reglor lamps, the round coulee shaped one, I am going to make some for my Persian Dancers. Any condition will do. Let me know. Hi Annette. I don’t have for sale at this time…keep checking eBay & Etsy. I just put 2 Bonnell Lion Prints on Etsy. Check them out. I hope they are priced to sell. I wanted to thank you for the piece you did on Gay Fad studios. Really handy in my write up on a Mississippi state souvenir glass that I just did for my Etsy shop. Looked at your Wanted post too and I do have that large sunbeam mixer bowl in my shop, in the event you haven’t found it yet. Just in case…..
You’re welcome Meredith. I’m headed to your shop right now for that bowl!!! Thanks Meredith. I’m looking for the bowl in aqua. If you come across the large Sunbeam mixer bowl in aqua, please let me know :). Whoops sorry, I didn’t realize they actually came in different colors! Hope you find it! No problem, we still appreciate you reaching out to us. :)! I loved your story about the fish plaque that fell off the wall. I can’t believe the prices, which is why I will never have any. I remember them on my Great Aunt’s bathroom wall along with all the other awesome deco from that era. Ahhh to be young again! I love the pic’s thank you for bringing back a fond and sentimental memory. Send me your address to shane@hepcatrestorations.com. We would LOVE to give you one from our collection!!! I have 12 Turner Wall Accessories. Would you be interested in buying any of them. Hi Alda. Thanks for reaching out. We’re good on Turner. I have a pair of Sexton 1972 USA wall handing of a boy and girl praying with their pets. Both have engraved number 1180 wall hangings. The boy has black hair and wearing orange pj’s praying with a puppy and the girl has red pj’s with blond air with a kitten. Very cute and in great condition. I am interested in knowing value of this set. Thanks! I’m George Telo’s Grandson, I have all his work…. We need to talk , I would like to work with you…. Hello Dave, I love your grandfather’s work. I would love to do an in-depth blog about him and his history and pictures of additional artwork that you may have that I could post. There’s something about that airbrush art from that era that just captivates me. Sorry for my late response things of been hectic around here. I have lots of vintage mid century items. Our store is The Ultimate Garage Sale Store I & II in Hickory, North Carolina. We are originally from New York. I have tons of pics on our facebook page. Let me know if there is anything you see that you may want us to ship. We don’t charge tax either. Hello Michele, Thanks for your offer. We will check you out! i have a pair of carlo water colors with 2 ballet dancers (male & female) heavy wood grain frame where top is about 2 1/2 x wider than bottom and sides flare out. Thanks David. We’re good on ballerina Carlo paintings. Sure, can you send pics to shane@hepcatresto.com?